Here’s a copy of our under-exposed manifesto, originally printed as part of an introductory essay in Issue One. 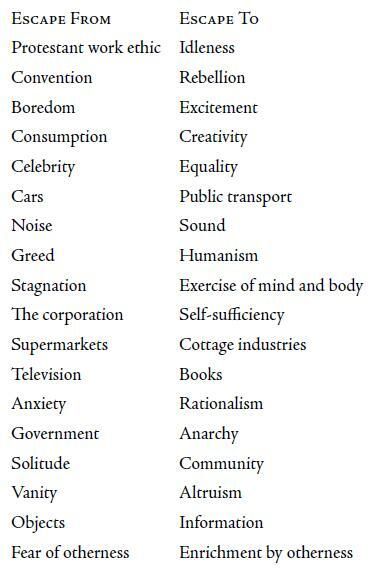 It occurs to me that we’ve focussed a lot of discussion on replacing the Protestant Work Ethic with Idleness (thanks largely to the inertia from our collaborations with the Idler), and that “Convention/Rebellion” was the subject of Issue Two: The War Against Cliché, but we’ve only skimmed the surface of the other topics. There is still so much to think about if we want to build up a proper treatise on the Escapologist’s life. It’s a nice little manifesto though, isn’t it? Three years after jotting it on the back of a Scotrail train ticket, I don’t think I would change much about it. Such direct simplicity. It is perhaps strange that Minimalism doesn’t feature explicitly, but is most certainly a facet of the “Objects/Information” dichotomy. Also, I suppose ‘walking’ could be added as an antithesis to ‘cars’, but doing so might dilute the implied community-minded parable of using public transport over cars: that to contribute a small amount to a public service is more productive than investing in the illusion of one’s own privacy. What do you think, dear reader? Can you think of anything to add or amend? 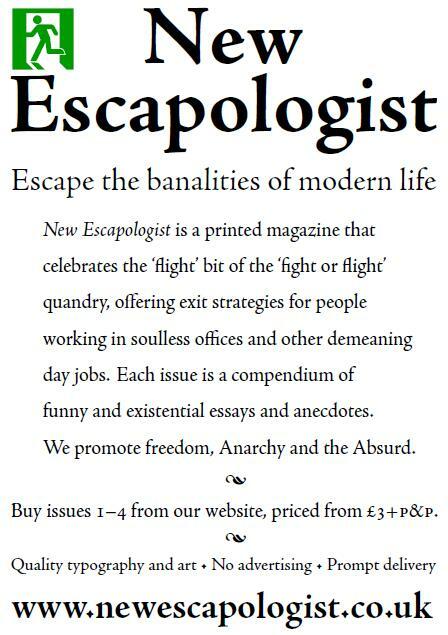 Samara and I will be selling New Escapologist at Expozine 2010 on Saturday and Sunday. Come along if you’re local. 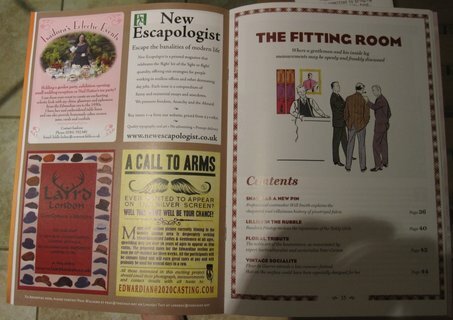 In preparation for the weekend, our apartment is now a stockroom for several hundred copies of New Escapologist. If you’d like to relieve some of our burden, Issues 1-4 are (as ever) for sale at the shop. The only real difference between an Escapologist and someone who simply hates their job is that the Escapologist has begun to take deliberate measures toward actually changing things. I think most people who hate their job don’t realise that escape is an option. From an arrogant interview I did for Andrew Williams at his new blog, Rainy Day Wonder. As something of a follow-up to last week’s divisive post about ‘Weekday Vegetarianism’, I recorded a one-hour podcast with my friend Daniel Godsil to capture our various thoughts around vegetarianism and meat consumption. Dan is a lifelong omnivore and used to work as a butcher, so he’s a good mirror to my nine-year-long vegetarianism. I think this is a pretty balanced conversation and we both (hopefully) get a few good points across. The podcast is called Wringham & Godsil: V is for Vegetarian. There’s a bit of swearing on it and a few tasteless digressions. Sorry about that. There’s something about the medium of podcasting that invites it. In any event, enjoy! As I understand it, New Escapologist is now stocked at the GmbH shop at Glasgow’s The Modern Institute. TMI was always an excellent contemporary art gallery so it’s a pleasure to have been accepted there. 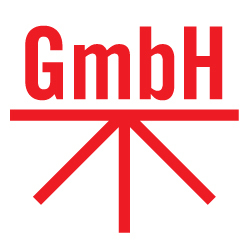 The GmbH itself seems a superb project, filling the indie and artsy publishing gap after the closure of Borders Books last year. Pop in and buy a copy of Issue Four, supporting their decision to stock us, if you can. Cheers to Neil for getting this going. I’d like to extend a special welcome to any chaps or ladychaps arriving at our publication after the recent advertorial in Gustav Temple’s most esteemed publication. Hello! We hope you stick around. You can purchase our printed editions at the shop and subscribe freely to our RSS feed.